We love to sing and to listen to beautiful singing and instrumental music! Music is an integral part of our worship life at PEACE Lutheran Church. You will hear all kinds of high-quality, sacred music at both our worship services, and sometimes at special events outside of worship. Some works were chanted by Christians more than 1,000 years ago. Others were composed by the early Lutherans 500 years ago. Still others are based on spirituals or were written for revivals in the 19th century. More still have been drawn from African and Latin American churches in the 20th century or penned in the last three decades. Our music is an offering to God – expressing our joy, thanks and praise. We also use music to pray and to express our brokenness, sorrow and yearning to see God’s face. Through song, we teach about Jesus and wonder about the works of the Holy Spirit in our lives and in the world. You’ll find that we sing a lot during the worship services! The congregation sings hymns, psalms and responses to prayers. Some members even sing in harmony – it’s a cherished Lutheran tradition. But don’t feel you have to sing along if you don’t want to. You also will hear beautiful works performed on organ and piano and sung by our talented staff musicians and our dedicated choir. Whenever we can arrange it, we also invite guest instrumentalists and vocalists, most of them church members. 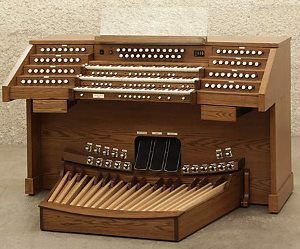 This 3-Manual Bravura organ, by the Allen Organ Co., looks much like the organ we hope to acquire at PEACE Lutheran Church. Learn more about our PEACE Memorial Organ Campaign. Be a part of our dream to install a new, combination digital-pipe organ in our Sanctuary!